I'm posting this a bit out of order as it was made before Christmas. That aside, I had such high hopes that the Seamwork Wembley Cardigan would fill a large, cardigan-shaped hole in my cupboard, but alas it was not to be. This make is a big fat, ill-fitting fail. This is the third toile I made of this pattern - the other two ending up in the bin. To be fair, I was sewing this whilst off sick, so I think the other two fails were the fault of my fuzzy brain. This one however, is just ill fitting and not very comfortable to wear. I sewed an XL - my standard size in Colette and Seamwork patterns, but I think this is a bit big - as you can see the shoulder seams are falling off my shoulders. The sleeves are also an odd length - not full length, and not 3/4 - just somewhere in no-mans-land, and a very unfaltering and annoying length in my opinion. I'm having a major issue with the neckband also. I had trouble figuring out how the pattern pieces went together (the instructions were a bit unclear to me at this stage and a better illustration would've helped - or simplier pattern pieces) and I think matching two straight pieces together (at the back of the neckband) would have been easier than what was provided...which I don't have the brain power to explain but seemed unnecessarily complicated. All that aside, the neckband is way too loose and does not sit flat against my neck -- this is the best I can get it to look. 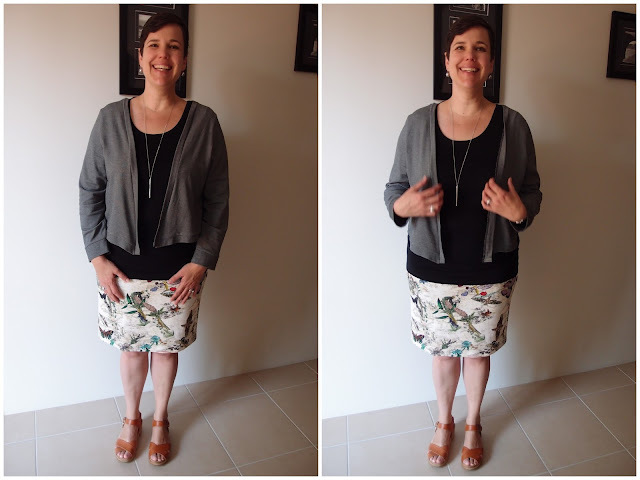 It's a shame this did not work out as the fabric was a nice remnant that I picked up from Tessuti in Surry Hills and it feels really nice to wear. Now that I look at the Seamwork website again alot of my issues are evident in their photos...you just have to really look for them.